Sunset offers nine photos of before and after small yard projects full of great ideas. Even the most disheartening small yard spaces can be made to look spacious and cozy. One of the best takeaways: When possible, create various levels in a small yard either by creating terraced "outdoor rooms" or simply by using raised planter beds. See their photos at Sunset.com. 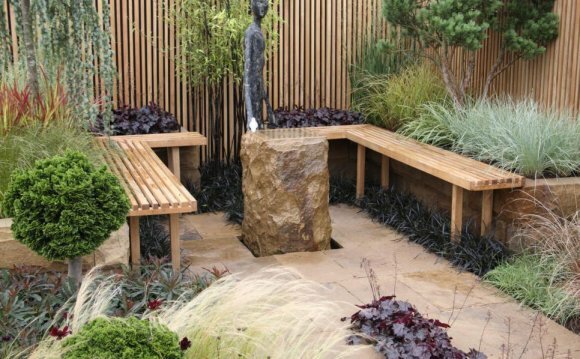 Small yards should always include at least "two rooms"
Garden artisan Scott Cohen is an expert when it comes to designing functional yards. Check out his incredibly useful tips for small yards. Some of the best takeaways: No matter what the size of the yard, it should always include at least "two rooms". Cohen offers ideas for how to use backyard water features and other elements to break up space. He also explains how the reflective quality of water makes everything look larger. Check out his tips at GreenSceneLandscape.com. You'll find tricks of the trade in this small yard slideshow from BHG.com. Each slide offers a specific tip for small yard design. Some of the best takeaways: Place bright, bold colors in the front of a small landscape because they catch attention first, making the rest of the yard recede and feel larger. Also, take advantage of texture in lush plantings. Large leaf plants and patio trees change the scale of a small space. See all the small landscape tips at BHG.com. In his book, Tomorrow's Garden, Stephen Orr explains how dividing a space makes it seem bigger. As counterintuitive as it sounds, using a tall hedge, wall, fence or clump of shrubs to partially block a view in a small backyard actually makes the yard more intriguing. Separating small spaces into discrete areas will make a yard seem larger. Find out more from by Stephen Orr. Our photo gallery is brimming with small yard photos. Get ideas for your yard from photos of all types of themes, from Mediterranean style small yards, to yards incorporating unique water features and even small pools. Check out our small yard photos.